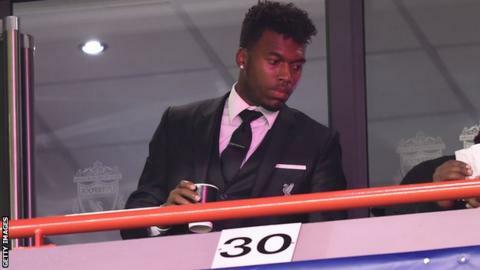 Liverpool boss Jurgen Klopp says Daniel Sturridge must learn "what is serious pain and what is only pain" in order to overcome his injury problems. The 26-year-old striker withdrew shortly before the Reds' Europa League win over Bordeaux on Thursday after picking up a foot problem in training. Sturridge has been plagued by a series of injuries which have restricted him to 18 appearances in 2015. "Everyone wants him back on the pitch but we all have to learn," said Klopp. Speaking before Sunday's game with Swansea (16:15 GMT), he added: "The situation is Daniel was very often injured in the last few months, and maybe years, so it is normal when you get back in training usually it is not the quality, but you need training. "Your body has to learn to adapt to new intensities of training and in this time you have to learn what is serious pain and what is only pain." Sturridge joined Liverpool from Chelsea in January 2013 and went on to score 28 times for club and country in 2013-14. He then picked up a hip injury against Manchester United in March, which cut short his season and led to an operation in May. Sturridge played three games at the start of this term but a knee injury has kept him out since 4 October. "When Daniel comes back after this long break you would train five weeks in a row and play only in friendly games," continued Klopp. "That would be the best, but of course we know the world is not perfect so we have to try the best and the quickest. "It is a really long period so now we have to stay patient I am sorry to say. I'm sorry for you, sorry for me, sorry for him." The injuries he has suffered since the start of last season. While Sturridge's fitness for the Swansea game remains doubtful, Klopp said he is also unsure if fellow forward Christian Benteke will be ready to feature. The Belgium international, whose goal won the game against Bordeaux, has already played two full games in five days. "I don't know in this moment if Christian is capable of playing two games in three days. We will have to decide," he said. "But it is not the most difficult situation at this moment with the strikers because we have Christian, Divock [Origi] and Roberto [Firmino] who are good. "We need all of them for this big number of games."